The sewage to deal it is pumped in the upper part of the tower and sprayed down to the bottom, there it meets the air flow in counter-current pushed by the fan. This phase allows of the passage from the liquid status to the gaseous one of the polluting. 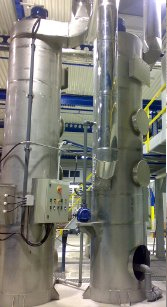 The air then passes through a chemical Scrubber for the cleaning of the polluting to reach the limits of law and released in the atmosphere. 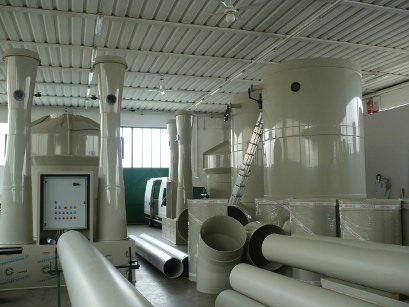 Using warm air the efficiency of the stripping tower can be increased obtaining reduction of the dimensions of the system.